As everyone said goodbye to summer and sent their kids off to school, Friendship Circle of Brooklyn started their year off with a bang, enjoying the last licks of warmth and sunshine. On a bright Wednesday afternoon, a Welcome Back Block Party was arranged for all FC families. Laughter and lively chatter soared above the music. 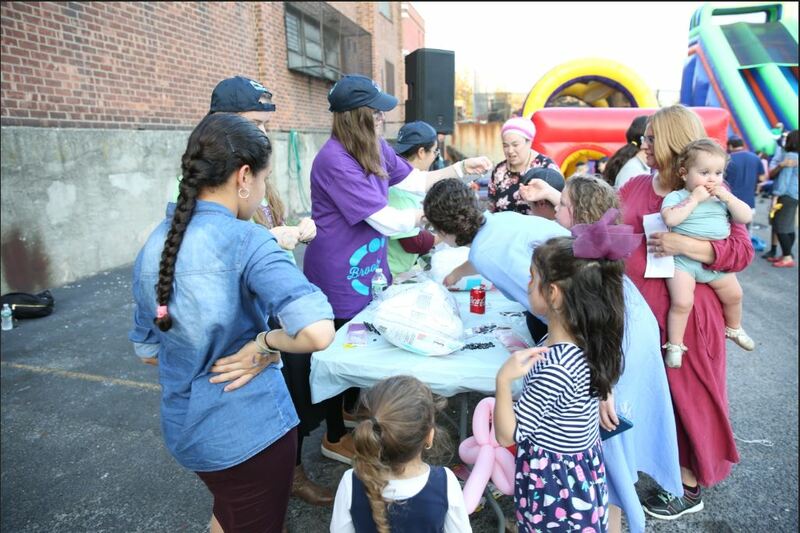 A large moon bounce, inflatable slide and obstacle course filled up one side of Beis Rivka’s parking lot, while on the other side, families enjoyed delicious food prepared by JJ’s Holy Cow. Children had fun participating in the various carnival-style booths, which featured cotton candy, Rosh Hashana crafts, face painting, clowns, balloons, animal petting and more. The event was co-sponsored by Encore Support Services and Crown Heights Urgent Care, with special thanks to community liaison, Yossi Hershkop. Thank you to Rabbi and Mrs. Berel and Chani Majesky, Rochel Karp, and Lulu Feldman for organizing the event. Friendship Circle would like to express their utmost gratitude to Rabbi Benjy Stock, the board, staff and faculty of Beis Rivkah for going above and beyond; Ira Jablonsky and Officer Gardner of Community Affairs at PBBS for keeping everyone safe; and to Senator Jesse Hamilton for gracing us with his presence. Special thanks to Yaakov Behrman and Superintendent Rice of the NYC Sanitation Department for going out of their way and ensuring a smooth post Labor Day cleanup.